At their best, cookbooks are more than collections of recipes. They’re friends with stories to tell and ideas to share. No wonder so many food lovers toss a cookbook or two in with the novels to read at the beach or summer cabin. 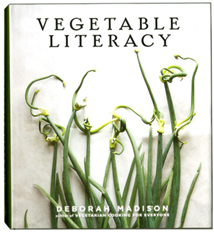 “Vegetable Literacy,” by Deborah Madison (Ten Speed Press, 2013), is the only traditional cookbook in the lot. It’s filled with tantalizing recipes for summer’s best produce and many of them are simple enough to make in the kitchen of a rented house with vegetables plucked from the farm stand. But it’s so much more. Madison, who’s been the go-to source for vegetarian recipes since she wrote the “The Greens Cookbook” in 1987, has taken a radical new approach in her ninth cookbook. She writes from the perspective of a curious gardener, grouping vegetables and herbs into 12 botanical families from which the members are often interchangeable with one another. 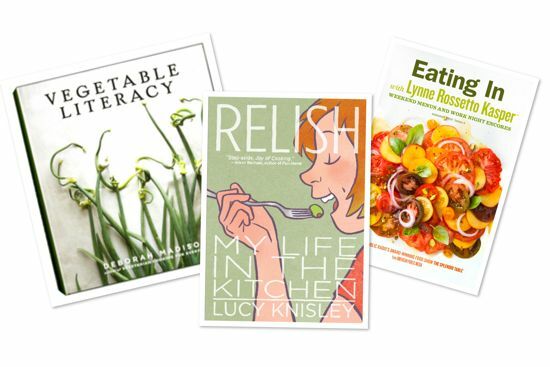 Along the way, she blends botany, history, gardening tips and kitchen wisdom with recipes that celebrate the essence of each plant. I can’t wait until I have enough ripe tomatoes to make her Tomato and Cilantro Soup with Black Quinoa. Or when the Delicata Squash are ready to be roasted, tossed with Dukkah (an Egyptian condiment of toasted nuts and seeds with cumin) and served with a tahini-yogurt sauce. Until then, I’ll lose myself in Madison’s fascinating exploration of the plant world and the beautifully understated photographs of Christopher Hersheimer and Melissa Hamilton. No doubt, I’ll pick up a wheelbarrow load of ideas for next year’s garden before I’ve made my way through the families from carrots to morning glories, which include sweet potatoes. The Sweet Potato Flan with Maple Yogurt and Caramel Pecans sounds irresistible. 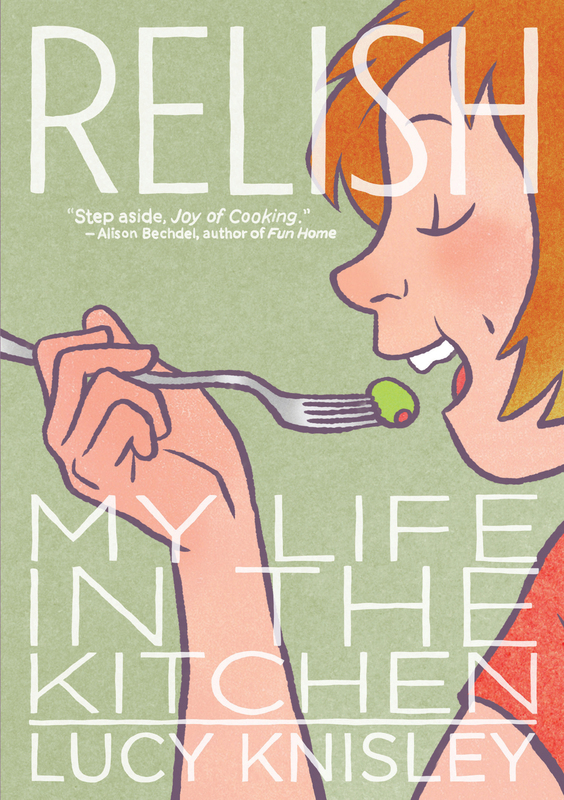 “Relish, My Life in the Kitchen,” by Lucy Knisley (MacMillan, 2013) breaks the mold with a graphic memoir sprinkled with recipes. This is a charming book of a young woman’s introduction to good eating as the daughter of foodies. Knisley grew up coloring in the kitchen while her mother worked at Bouley in Manhattan, shucking oysters in her uncle Peter’s take-out food shop, and helping out at farmer’s markets after she and her mother moved to the country. By the time she went to art school in Chicago, she was saving her money to eat at the temples of gastronomy. One was a 13-course meal at Alinea, which she immortalized in her comic strip journal. The drawings are fresh and charming with a gently humorous edge. The recipes – which range from an architectural rendering of huevos rancheros to step-by-step instructions for rolling sushi – are great fun. My family loved her chocolate chip cookies with an extra pinch of salt. Enjoy this book on a lazy afternoon and then pass it on to that teenager you’ve been trying to get into the kitchen. Knisley makes cooking look like fun. 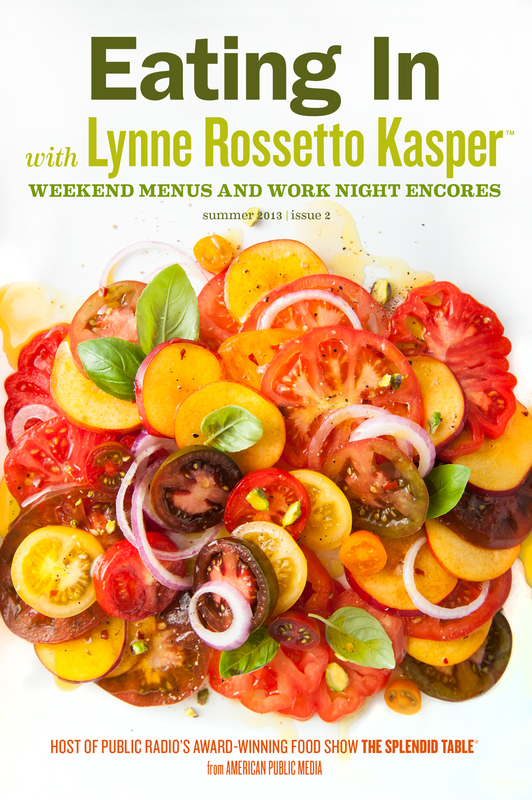 “Eating In with Lynne Rossetto Kasper,” by Lynne Rossetto Kasper (American Public Media, 2013) is one of the best cookbooks I’ve seen that is designed specifically to take advantage of the bells and whistles the Internet has to offer. It’s set up for reading on your laptop, iPad or Kindle with links to sources for ingredients and episodes of Kaspar’s podcasts. Of course, you’ll need wifi or a cell phone connection to use them all, but it will stand on its own, too, if you’re out in the boondocks this summer. Kasper, host of “The Splendid Table” food and cooking talk show on National Public Radio, is releasing installments of this book quarterly at the bargain price of $3.95. This, her second offering, revolves around a summer grilling party. Written in the chatty, we’re-all-in-this-together voice that’s made her radio show such a hit, these little books are filled with helpful tips and techniques as well as beautiful photographs. The centerpiece of this installment is a cut of meat Kaspar calls, the Bargain Steak Nobody Knows About. It’s the large, vaguely triangular piece of meat at the top of a boneless chuck pot roast. Kasper trims it away from the tougher segments of the roast, marinates it in a red wine sauce, and then grills it slowly over low heat. The results were truly impressive. We don’t eat much steak, in part because the good cuts are so expensive they practically require a bank loan to buy. This cut makes good more less of an investment. 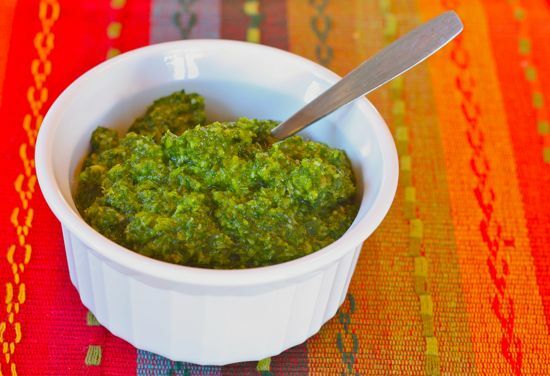 The green herb salsa Kasper suggests to go with her secret cut of beef is an inspired combination of parsley, basil, mint and oregano whirled in the food processor with scallions, capers and – believe it or not – the tiny pickles the French call cornichons. This salsa would be a good accompaniment to fish, pork, chicken or shrimp. Kasper suggests using it on pasta or pizza. I would be happy to just eat it with a spoon. Warm garlic and olive oil together in a microwave safe bowl, covered with a paper towel, in the microwave for 1 minute. Or simmer briefly in a small saucepan on the stove. Set aside to cool. With the food processor running, pour the cooled oil and garlic through the feed tube and mince for a couple of seconds. Stop the machine and add the herbs, capers, cornichons and vinegar with 1/4 teaspoon salt and a generous dusting of freshly ground pepper. Pulse just until herbs are chopped into 1/4-inch pieces. Adjust seasonings to taste and transfer salsa to a serving bowl. Lightly cover and set aside for a few hours at room temperature to let the flavors develop. May be stored in the refrigerator for a couple of days for future use. Be sure and cover with plastic wrap pressed onto the surface of the salsa in order to keep the herbs from turning brown.